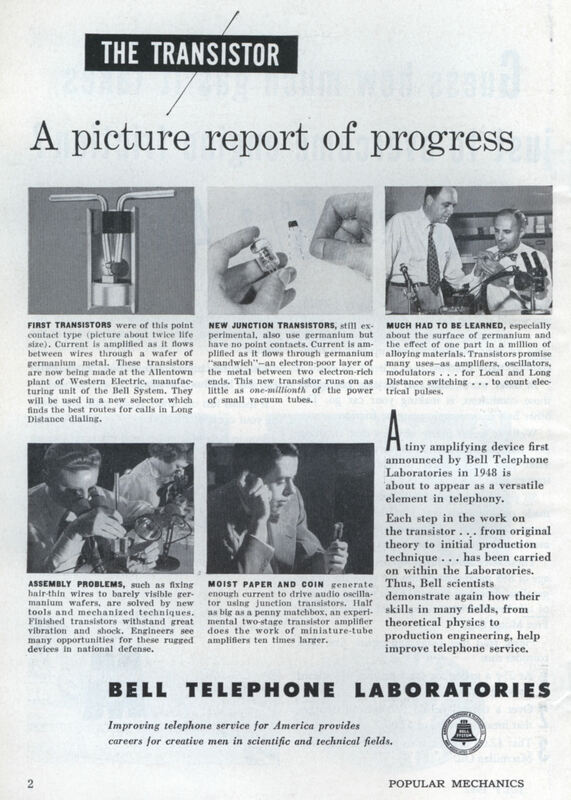 A tiny amplifying device first announced by Bell Telephone Laboratories in 1948 is about to appear as a versatile element in telephony. Each step in the work on the transistor . . . from original theory to initial production technique . . . has been carried on within the Laboratories. Thus, Bell scientists demonstrate again how their skills in many fields, from theoretical physics to production engineering, help improve telephone service. plant of Western Electric, manufacturing unit of the Hell System. They will be need in a new selector which finds the best routes for calls in Long Distance dialing. NEW JUNCTION TRANSISTORS, still experimental, also use germanium but have DO point contacts. Current is amplified as it flows through germanium “sandwich”â€”an electron-poor layer of the metal between two electron-rich ends. This new transistor runs on as little as one-millionth of the power of small vacuum tubes. MUCH HAD TO BE LEARNED, especially About the surface of germanium and the effect of one part in a million of alloying materials. Transistors promise many usesâ€”as amplifiers, oscillators, modulators . . . for Local and Long Distance switching … to count electrical pulses. ASSEMBLY PROBLEMS, such as fixing hair-thin wires to barely visible germanium wafers, are solved by new tools and mechanized techniques. Finished transistors withstand great vibration and shock, Engineers see many opportunities for these rugged devices in national defense. MOIST PAPER AND COIN generate enough current to drive audio oscillator using junction transistors. Half as big as a penny matchbox, an experimental two-stage translator amplifier does the work of miniature-tube amplifiers ten times larger. 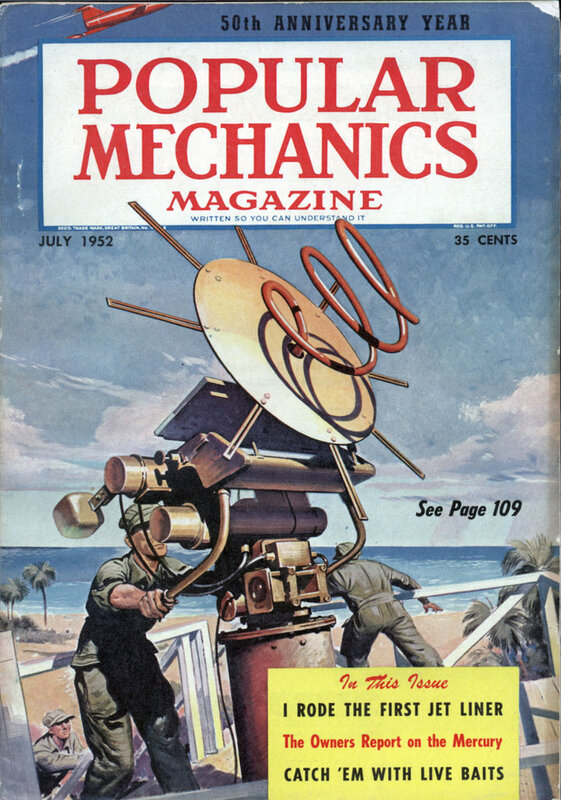 Improving telephone service for America provides careers for creative men in scientific and technical fields. Only a little commentary. Surely caused by a typo, but the year of anouncement of the transistor is not 1918, but 1948.